CASTELWELLAN’S colourul history will soon be collected in a new community-driven project thanks to the Lottery Heritage Fund. Down District Council in partnership with Castlewellan Futures has received £50,700 from the Heritage Lottery Fund (HLF) for the community to explore Castlewellan’s Heritage. The Annesley Family Legacy and Lives of Ordinary Folk project will explore Castlewellan’s rich heritage in depth and interpret it for the benefit of the community and tourists. 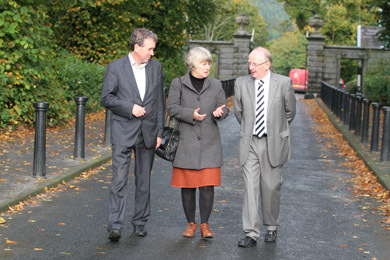 At the front gate of Castlewellan Forest Park are Paul Mullan, LHF with Sally Montgomery and Michael Burns of Castlewellan Futures. Led by volunteers from the Castlewellan Futures’ Heritage and Forest Group, this exciting development will explore the rich heritage of the town and Castlewellan Forest Park. It will enable young people from six local schools to research a key element of this heritage and then share their stories together. Letters have been sent to St Mary’s Primary School, Aughlisnafin; Annsborough Integrated School; St Malachy’s Primary School; Bunscoil Bheanna Boirche; Castlewellan Primary School; and St Patrick’s Primary School (Burrenreagh) inviting them to take part. Sally Montgomery of Castlewellan Futures said: “We set up about two years ago and our aim is to develop an integrated plan for Castlewellan. We have a number of themes such as heritage and another centres around energy. But the Castlewellan Forest Park is a key project. “If the forest park develops in the future there will be clear spin-offs to the town and the business sector. We want to engage the community and create a new vision for Castlwellan. As the heritage project unfolds we will collect some archive material and will be receiving some training from Down County Museum on collecting this and the aural history. “We have a great base of around 20 volunteers such as local historian Michael Burms working on this project. Much of the work will centre in the study of the Annesley family who developed the estate over 200 years ago. The stately Annesley home looking south to the Mournes over Castlewellan Lake. As part of the rolling out of the heritage project, Castlewellan Furures will be working closely with a youth group from Castlewellan who will develop and perform a play about the Hiring Fairs traditionally held in the town in the eighteenth and and nineteenth centuries. The community will also be invited to share their stories and add to the research which will culminate in a small exhibition, a heritage trail, map, and a series of 10 interpretation panels taking the visitor from the town through to the park. The project will culminate in a community festival event and the re-staging of the Hiring Fair play to summer visitors. Evidence of the rebuilding of the town, which commenced around 1750’s, remains including the old Market House dating from 1764 and the upper and lower squares. The market town flourished with the development of spinning, weaving, and bleaching in the local linen factories which took advantage of a water supply from a small stream fed by a lake on the Annesley Desmesne. The Annesleys added to their legacy over the years for example, by building the Castle in 1856 as their main residence, commissioning St Paul’s Church from Charles Lanyon in 1850s and developing the walled garden and the now nationally important Arboretum. Paul Mullan, Head of Heritage Lottery Fund NI, offered his encouragement and said: “We are delighted to be supporting this local heritage project which will see the community of Castlewellan actively researching and sharing their heritage. 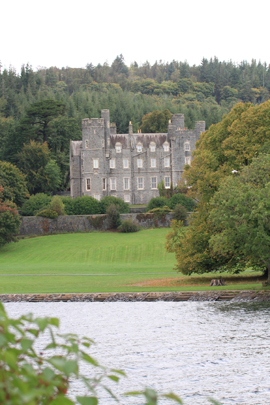 Anyone who has ever visited Castlewellan can be in no doubt about the wealth of heritage within the area from the striking buildings, layout of the town through to the magnificent country park and arboretum. Down District Council Chairman, Councillor Maria McCarthy, added, “We are delighted that the HLF has chosen to support this opportunity for the community to explore their heritage and in particular the legacy left by the Annesley family and the Forest Park.